Submitted photo Xenia’s kids of character pictured with Superintendent Dr. Gabe Lofton and board president Cheryl Marcus are Silas Currier, Wyatt Long, Elijah Roseman, Matthew Long, Rachel Graham, and Gavin McManus. Not pictured are Kylee Luckett and Rebecca West. 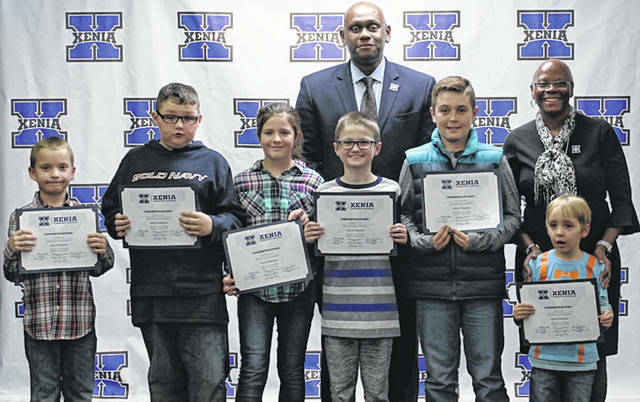 XENIA — The Xenia Community School District Board of Education recognized kids of character for November. Honored were Silas Currier (preschool), Wyatt Long (Arrowood Elementary), Elijah Roseman (Cox Elementary), Matthew Long (McKinley Elementary), Kylee Luckett (Shawnee Elementary), Rachel Graham (Tecumseh Elementary), Gavin McManus (Warner Middle School), and Rebecca West (high school). Currier comes to school every day with a positive attitude. He gets along really well with all of his peers, and is very comforting to friends who are sad, or who just need someone to play with. Currier always comes to school and does his best work, and listens and follows all of the classroom rules. He helps the other students with their work if needed (finding their name on the question of the day, being an example on how to complete an assignment, showing friends how to stand in line), and always is a big helper in cleaning up the classroom. Wyatt Long is the epitome of a kid of character. He is very respectful to everyone in his class, and he always has a smile on his face. He is an extremely hard worker and is a pleasure to have in class. Arrowood is focusing on practicing kindness every day, and Long is one of those rare kids who is always kind. He truly makes Arrowood a better place. Roseman comes to school prepared to learn and has a very positive attitude. He shows initiative and often performs little acts of kindness that help make the class run smoothly; for example, he usually takes down and puts up the chairs of absent students, picks up pencils from the floor that are not in his area, holds the door for others, and is quick to offer help. He has such a kind heart and recently made get well cards (in his free time, of course) for a friend who had been home sick. “Elijah shines with Pride,” said his teacher Angie Reed. Matthew Long is a very hard-working student who exemplifies the three characteristics emphasized at McKinley — respect, responsibility, and being a problem solver. He has shown “responsibility” because he is a trustworthy student who has a positive attitude and a desire to learn; he is “respectful” because he is polite, kind, and sincere at all times; and he is a “problem solver” because he demonstrates tolerance, humbleness, and compassion for others. Long is always eager to participate during class discussions and is determined to persevere when given a task to complete. His teachers consider him a model student for his peers. Graham is Tecumseh Elementary’s problem-solving superhero for November. The entire class could not remember the word of the month so she listened very carefully to the announcements until she heard it and reminded the class. In an even bigger situation, Graham worked together with her mom and another teacher to come up with a solution to make sure she had all of her work turned in when she was absent. She felt great about the solution. Problem-solving is one of her best skills and Tecumseh is lucky to have her as a student. McManus is an extremely hardworking sixth grader. Every task he is given, he strives to do his best and give it his all. He is respectful of teachers and other students alike, and is always there to give a helping hand. He participates in Xenia’s Wee Bucs football program and the Xenia Elite basketball team. In the midst of these extracurricular activities, McManus still maintains excellent grades. He exemplifies the three pillars of success which are respect, responsibility and integrity, to the highest levels, each and every day. https://www.xeniagazette.com/wp-content/uploads/sites/32/2018/11/web1_kids-of-character-november-_ne2018118224918987.jpgSubmitted photo Xenia’s kids of character pictured with Superintendent Dr. Gabe Lofton and board president Cheryl Marcus are Silas Currier, Wyatt Long, Elijah Roseman, Matthew Long, Rachel Graham, and Gavin McManus. Not pictured are Kylee Luckett and Rebecca West.